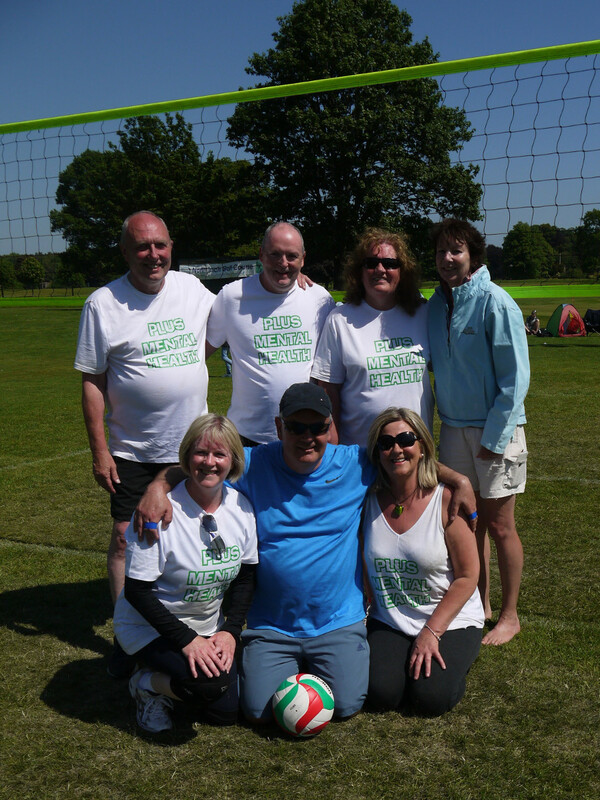 Volleyball fans and players descended on Perth’s North Inch for the greatest outdoor volleyball event of the year and what an event it was this year with the sun splitting the sky and teams from far and wide converging on the volleyball capital of the UK last weekend. 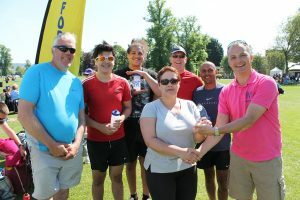 Loads of local teams from Perth, Angus and Fife were joined by teams from further afield with newcomers Reighin from Romania being the furthest travelled, joined by two women’s teams from the Faroe Islands and a men’s team from Overpelt in Belgium. 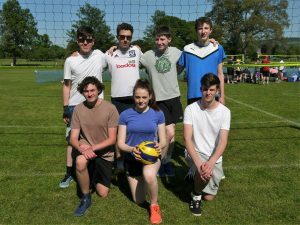 Scottish Internationalist Seain Cook, fresh from his beach volleyball exploits at the Gold Coast Commonwealth Games was also on display with father Iain playing for local side Dodgy Spikers and mother Mary playing for Aberfeldy. Former Kinross player Connor Boyle, now playing his volleyball with Mallory in London had also made the journey north for the weekend tournament. The men’s division one was hotly contested with some top class volleyball and it ended up with Boyle and Cook facing each other in the Sunday final with their respective teams with Cook’ side (Let’s Get Tropical) winning the first set 25-22, but Boyle’s team (Codey’s Canadian Cheerleading Club) fought back to level the match with a 25-14 score. The third set was more evenly contested with Codey’s winning out at the last 15-12. In the women’s division it was Hannah Paisley’s Ayr based side “We’re Setsy” who came out on top beating Faroes side IF by two sets to one (25-16; 23-25; 15-11 to lift the trophy. In men’s division two Volei Reghin dumped Perth side Dodgy Spikers to reach the final against Kazhakhstanada. The Romanian side lost the first set 13-25 but changed things around to win the second set 25-21 to take the final to a third set decider. It was the Reghin side who won through in the end 15-9 to take a special glass trophy back home with them. 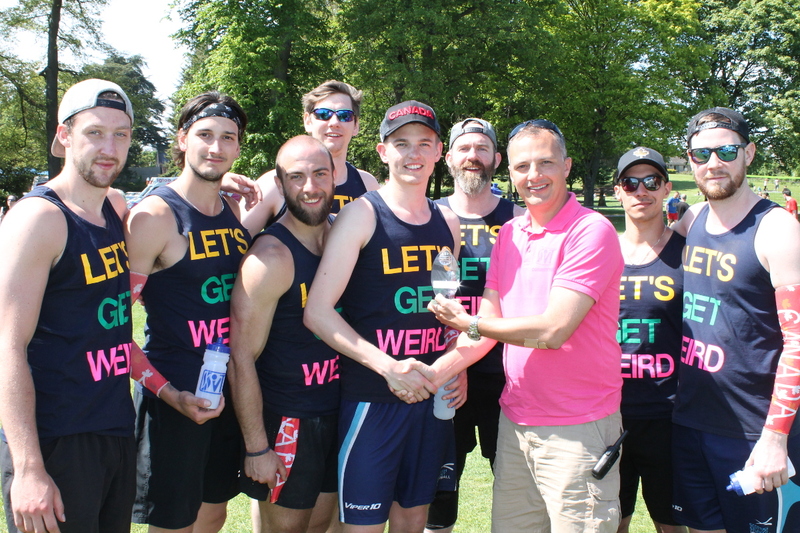 Men’s division three had four local sides competing: Andrew Lochhead’s Perth based Team Awesome, Matthew Moloney’s Kinross based Minion Mongrels, Carole Hardy’s Dunfermline based Dunfermline Phoenix and Kerpis Gint’s Forfar based Super Heroes in Training. Dunfermline Phoenix and Minion Mongrels were drawn together in the first qualifying match on Sunday morning with the Phoenix side’s experience just proving too much for the Kinross youngsters, winning 25-17; 25-22. The division three title was decided by a three way play off and it was the Dunfermline side who won through beating both of their opponents (Block it Like It’s Hot and The Leftovers) to lift the glass winners’ trophy. 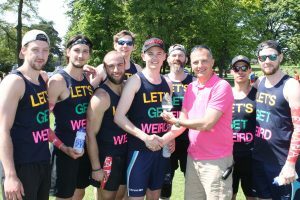 Edinburgh based side Backpackers came out as trophy winners in Mixed Division One with another Edinburgh side, The Bears winning Mixed Division Two. A massive 36 teams competed for the Mixed Division Three title with lots of local interest with Mary Cook’s Aberfeldy, Declan Greenwood’s It’s Yersel’, Donna Bell’s Jolly Volley, Andrew Stewart’s One Shot Wonders, Kirsty Imlay’s PEVC, Susan Scott’s PLUS Perth, Greg Marshall’s Renegades (all Perth) and Dundee sides Sets on the Beach and Set it and Forget It. The eventual winners were Bridge of Allan side Incrediballs. The tropical weather certainly made this year’s Scottish Open particularly memorable with a festive, carnival atmosphere evident throughout the weekend. 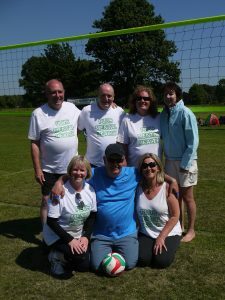 We are currently planning the 2019 tournament for 25th & 26th May 2019, but are awaiting confirmation of venue bookings…SO THIS IS STILL NOT DEFINITE. We’ll update the website once everything is confirmed.